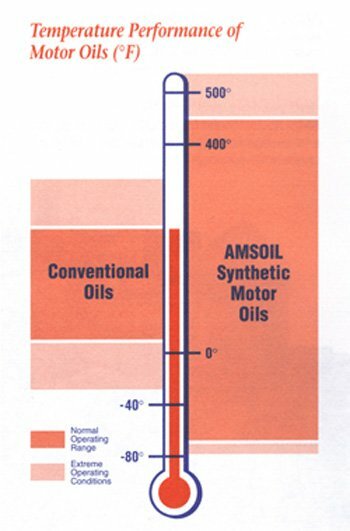 Synthetic Lubricants | What Makes AMSOIL the Leading Provider of Synthetic Motor Oil? Synthetic lubricants are chemically engineered from pure chemicals rather than refined from crude oil. That gives them significant advantages over refined oils. The feedstocks from which synthetic lubricants are made do not contain sulfur, nitrogen or other elements that invite the formation of sludge and other products of lubricant breakdown. Synthetic lubricants can be used in higher temperatures than refined lubricants without breaking down. Their resistance to breakdown also allows them to be used longer than refined lubricants can be used. Lubricated systems stay cleaner and last longer with synthetic lubricants. Synthetic lubricants differ from refined oils in three key ways: synthetics are pure, their molecular structure is uniform, and they may be designed to work in applications in which refined oils cannot. The feedstocks from which synthetic lubricants are made feature a uniform and smooth molecular structure, which ensures low friction as lubricant layers slide across one another. Reduced friction increases energy through-put for greater fuel efficiency and power and reduces heat and wear for longer equipment life. Many different kinds of feedstocks may be used to create synthetic lubricants, allowing a synthetic to be designed for virtually any application. Some feedstocks are ideal for use in extremely cold environments. Others are perfect for use in extreme heat. Some are extremely safe in applications in which refined lubricants pose a fire or explosion hazard. Refined oils simply do not offer the design flexibility synthetics offer. The design flexibility of synthetics also allows them to be tailored very specifically to the needs of everyday applications, such as automotive engines, commercial equipment or much industrial machinery. That specificity helps ensure long life and peak power, performance and fuel economy from the lubricated system and long lubricant life. In addition to a superior base stock technology, AMSOIL includes a chemically advanced additive package specific to equipment application. The finished product exceeds industry standards and ranks highest in overall performance and protection. Making these oils since 1972, AMSOIL is recognized as the leader in the industry by continually setting higher engineering benchmarks. The company’s position is never to formulate its lubricants down to a cheaper price, but rather to engineer products to be the best in the industry. AMSOIL formulates a wide variety of synthetic oils and lubricants for use in very specific applications. From a technical standpoint, that’s the only way a lubricant can provide the highest level of reliability and performance. Customers who want the best performance, protection, reliability and extended drain intervals choose AMSOIL for this key reason.